Towns, cities, and counties across the country use signs in a wide range of ways. Every day, municipalities and other small governments are finding new, more innovative ways to use signage. Wondering how signs can benefit your community? To give you some ideas, here's a look at the top 10 trends for municipal signs. Many communities use their signs to relay messages to the public. They post weather alerts so that people in the community can make travel plans around snow, pack sun block when a heat wave is coming, or find out other information related to the weather. Even reminders to change the clock can be useful, as they help local citizens stay organized and on track. Cloud-based technology lets municipal governments control their messages remotely. When your sign is integrated with cloud-based software, you can sign into the command portal from nearly any internet-connected device. Then, you can create messages, add videos, integrate visuals, and choose other information to post to your municipal sign. You can control all the signs throughout the city easily with this type of technology, and you can also schedule messages to appear at different times throughout the day. For instance, some cities give drivers updates on traffic conditions in the morning and reminders on community events in the evening. Healthy communities thrive when their community members are engaged, and many citizens want to be more involved but just aren't sure where to start. To improve community involvement levels, many areas use their signs to promote community events. When they need volunteers for food banks, blood drives, or other initiatives, they also share that information on their sign along with a short URL or an easy-to-remember phone number. Then, they reap the benefits of a more engaged community. As most signs are located near roadways, many cities also use their signs to promote safety information. When crime levels are up, they remind community members to lock their car doors. To reduce road deaths, they share tips about the importance of buckling up or not following too closely. Sometimes, they post seasonal information such as "watch out for ice on the road", "check the tread on your tires", "don't leave pets in hot cars", or similar types of safety messages. If there is a threat in the community, like an escaped prisoner, signs can also help to alert the public and keep an eye out. In addition to promoting educational safety messages, some cities also use signage to share other educational information. When used strategically, educational messages can help to improve the health of the community. For instance, during flu season, cities post messages about the importance of washing your hands to prevent the spread of the flu. If food or consumer products are recalled, cities can protect their community members by spreading the word about the issue so that people can take the appropriate actions. Municipalities can also share information about open enrollment periods for healthcare plans, sign-up dates for preschool programs, and more. To offset the cost of their signs and to help increase the funds in the municipal coffer, some communities sell sponsorships on their signs. There are a number of different ways to integrate sponsorships into municipal signs. Some cities invest in digital signs that have a static display area. Then, they put sponsor information in the static area and use the changeable LED portion of the sign to post messages related to safety, education, community involvement, and other essentials. In other cases, municipalities rotate messages from sponsors on the LED portion of their sign. Often, they post the company's name, logo, and contact info, or they may even share a short video related to the sponsor. Towns aren't always able to raise enough funds through taxation alone, and to help their budgets, they often hold fundraisers. Signs can be the perfect way to advertise these events and to solicit donations in general. 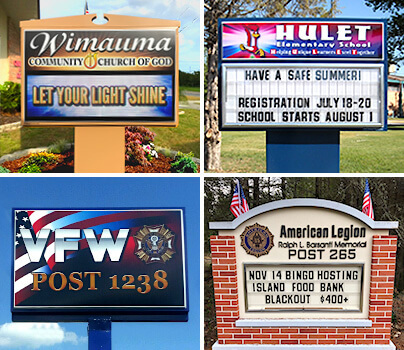 For instance, when a town is holding a Bingo game, a fish fry, a spaghetti dinner, or another type of fundraiser, it can promote that event and share details on its digital signs. Communities also use their signs to promote fundraisers for local nonprofits such as schools, the police force, local healthcare centers, and other groups that are tied to the community in key ways. To make their signage even more effective, many communities integrate their signs with other aspects of their community marketing plans. In particular, they use their signage to share details related to their social media accounts. Then, when community members follow the city's social media pages, they can see Facebook posts, tweets, or Instas about what is happening. That helps to amplify the community's message beyond what a municipal sign can do on its own. Communities also share reminders about voting days which helps to foster civic engagement and make the community more politically involved. They may post information related to polling locations or reminders to register to vote by a certain time. As election results roll in, cities sometimes even post the results on their signs. Smart signs can help communities in a number of ways. In large parks or outdoor shopping areas, signs can show maps and landmarks so that people can find their way around more easily. Auto-stereoscopic effects and 3D technology make these efforts even more effective, and touch screens can integrate path drawing technology so that users can navigate complex areas more easily. Additionally, smart features allow these maps to be updated in real time when renovations or other obstacles change the route through the area. In some cases, people can even sync the data from these signs onto their phones. Then, they can take the information from the sign with them on their journey. Municipalities even use this technology for bus stop signs, so they can post dynamic schedules and real-time updates related to delays. Your community deserves quality signage. To get a custom quote on municipal signs, contact us today. At Stewart Signs, we specialize in signs for schools, civic organizations, municipalities, and businesses. What Does Your School Sign Say About You? We are the trusted partner for sign projects of all sizes. For a sign designed for your needs, just request a Quick Quote!